The book, set in Australia, has two heroines, modern-day Ria Lubrano and her Edwardian grandmother Emma James. Ria Lubrano, who “came into the world with bones plotting mutiny”, suffering from a literal and metaphorical film over her eyes, is vegetating as a jingle-singer, a voice without an identity or even a complete song, her sense that life is just “a series of disengagements”. She is preoccupied with the loss of her brother Scott, who has drifted out of touch with his family and turned by degree into a missing person. She is also engrossed by the story of Emma, who married a Catholic boy and was renounced by her archetypal disciplinarian father. Susan has always been passionate about Australian (and women’s) writing. In 2011, she delivered the Ray Mathew Lecture at the National Library of Australia (following in the footsteps of Geraldine Brooks and Kate Jennings: what a lineup) — titled ‘Prodigal Daughter’ — where she explored the topic of expatriate Australian women authors and, in particular, the idea of returning home to our shores. For [Christina] Stead and the other expatriate women writers who came before and after her, including Miles Franklin, Henry Handel Richardson, Charmian Clift, Jessica Anderson, Germaine Greer, Madeleine St John, Katherine Gallagher, Barbara Hanrahan and countless others, Australia was a sort of antechamber to ‘real’ life and to the ‘real’ world, far from that many-mansioned house where art lived. As Susan returned to Queensland after 10 years in London (in 2010), she now asks whether anything has changed. You can listen to a podcast of the lecture or read it online. For anyone passionate about Australian writing, it’s a must. Susan’s memoir A Better Woman explores the physical and emotional impact of being a mother — and all her work stretches the boundaries of women’s writing in some way. In the latest in the ‘Writing Mothers’ series, I spoke to Susan about how to approach mother characters. How do you go about writing a ‘mother’ character? Is it different from how you approach other characters? A ‘mother’ character is not an alien, separate subject. No writer thinks, “Oh, I am writing a mother character” or “Oh, I am writing a father character or a child character or a neurotic character.” Any writer of integrity seeks to write characters of integrity, that is, characters which are recognisably human in all their distress, complexity, unwitting compulsions, stupidity and stumbling-ness. I suppose I would want any so-called mother characters I write to have the dignity of being as complex as any other character I seek to make recognisably alive. All my writing work is always a bit of both. First — always — intuition. Always the glancing feeling or the passing thought or the fleeting image that brings an idea to the heart and mind. Whatever the starting point, I work emotionally out from the centre first, and then later intellectually. Later comes the research, the reading, the sitting in libraries, etc. If I am specifically writing a mother, then sometimes I ask my friends for anecdotal stories to add to my character (for example, Nancy, in Life in Seven Mistakes, shared a lot of the characteristics of the mother of one of my close friends, and a couple of the incidents in the novel I shamelessly stole from other friends. I have a friend in Paris whose late mother once completely re-arranged her entire kitchen while she was at work one day, and I stole that episode for Nancy). Well, I think in some way one’s actual mother is always the ur-mother. Far more accomplished writers than me (Simone de Beauvoir, Adrienne Rich, Doris Lessing, Marguerite Duras, Charmian Clift, Kate Jennings) have written spectacular mother-women characters and these writers have written eloquently about the way their actual mothers sat in the centre of their daughter’s lives, forces of nature, pre-historic creatures, larger and more roaring than life itself. My own mother is a siren, a goddess, an ogre, more fixed than the stars or the moon. Of course I cannot help seeing in all mothers the shadow of my own, and in my own mothering of my sons I dance in her long, long shadow. Any writer worth his or her salt has to believe that everything can be conjured. What’s the point in trying to write if you don’t believe — foolishly, hopelessly, ardently — that some day, some time, somewhere, you might just be able to catch a little bit of human truth? I have written men (most notably, Billy Hayes in A Big Life, a whole novel written from the point of view of a boy and young man). I HAVE to believe that everyone can write everyone (although I reserve the right to argue that some writers do it better than others — VS Naipaul’s women characters? Nah. But Flaubert’s Emma? Yes, yes, yes). DEAR READERS, WHAT IMPACT DOES YOUR RELATIONSHIP WITH YOUR MOTHER HAVE ON YOUR CREATIVE PRACTICE? WAS SHE CREATIVE TOO? DID SHE TRY TO NURTURE OR CHALLENGE YOUR PASSIONS? Would love to hear your comments. If you enjoyed this post, you might also like: the ‘Writing Mothers’ series of interviews with Anna Funder, Debra Adelaide, Karen Andrews (Miscellaneous Mum blog), Fiona McGregor, Allison Tait (Life in a Pink Fibro) and Bianca Wordley (Big Words blog). 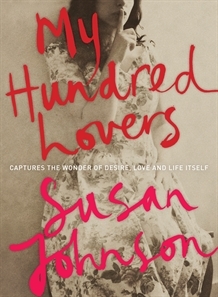 Planning to read “My Hundred Lovers”. Susan Johnson has such a visceral way of writing about the body. “A Better Woman” expressed what so many mothers were feeling but could never say. I was told to just forget about a traumatic birth experience I had and I can see it was right not to dwell on it. Sisters and women friends really didn’t want to know. It was really quite healing for me to read “A Better Woman” at that time. So thanks Susan Johnson! My mother was encouraging of any creative play if it were tangible and practical. She was happy for us to make and create and make mess. She was frightened of intellectual ambition however – of any ambition actually – and tried to quell all notions of it. Susan writes “My own mother is a siren, a goddess, an ogre, more fixed than the stars or the moon.” It makes me ponder the huge loss of my mother. But also makes me ponder the huge significant presence she still has in my life and in me. Fixed like the stars or the moon. I love that sentence of Sue’s. I see myself in it too, much as I try not to be an ogre! There are so many Australian women writers who don’t get the recognition they deserve, and I think Susan is one.